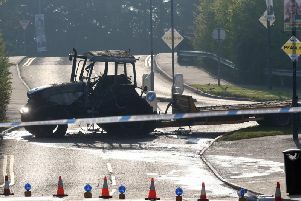 A Dromara man already doing community service was given an extra 50 hours last Thursday at Banbridge Magistrates Court. Mark McClure (25), Whitehorn Lane, Dromara, had admitted, at a previous court, unlawful possession of cannabis on March 16 this year. The case had been adjourned so that a pre-sentence report could be obtained. A public prosecutor said that police had gone to the defendant’s home and found him in a ‘delirious state’. He claimed to have had a seizure and believed someone was in the house. Cannabis was found in the bathroom and McClure said: “I’m getting this every month.” He admitted the drug belonged to him and valued it at a ‘tenner’. A barrister representing the defendant said his client was the subject of a combination order. District Judge, Mr Paul Copeland, imposed 50 hours community service for this offence, making the hours consecutive to the previous sentence. He told McClure that since April when the first sentence had been imposed he had been ‘dodging and making excuses’ and warned him if the hours were not done they would be revoked and he would end up in jail.